The adventure we call “porching” is the art of relaxation, the idea of conquering stress, embracing rest, absorbing tranquility and surrounding yourself with unbelievable scenery all-around. Porching is enjoying a late afternoon at Hacienda Rancho Los Banos famous wrap-around porches, after a great day of adventures, enjoying the day going by, drink in hand, surrounded by friends, old and new, listening to a quietness that is seldom experienced, watching nature go about its business, which in and of itself is very entertaining. Porching is seeing the sun silently disappear beyond the Sierra, seeing shadows appear and disappear, different colors turning the afternoon into something out of a living Monet masterpiece. Either in the morning, when the sun rises over the Sierra Madre, or in the afternoon, when it descends over El Cajon Canyon, the sites are spectacular, 360 degree views of desert hills, mountains, canyons, cliffs, sunsets and vegetation. Chatting and laughing, playing games or reading, the activities under Rancho Los Banos porches are endless. Whether discussing the day’s adventures, the inner workings of a cattle ranch or the current events of the day, conversation under the porch, with inspiration all-around, is hard to beat. So, too, is just chillaxing while reading an e-book, playing on a laptop or reading a magazine. 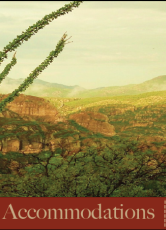 Playing horseshoes, archery, practicing roping, discovering your inner vaquera or vaquero, playing guitar or doing yoga, or taking a small stroll through the neighboring rolling hills are also popular. Enjoying the sunsets that only exist in this part of the world are also a guest favorite. Simply relaxing while the sun sets, cold beer or wine in hand, seeing shadows and colors rise and disappear, all in the comfortable warmth of the sun and the corresponding warm and gentle wind will feel invigorating, and stimulating. Whether enjoying warm coffee and breakfast on the porch, or evening darkness as millions of stars make their presence known, our porch will become like a second home, a place of memories made and enjoyed, a comfortable reminder of your stay with us, where friends are made and kept, all in the stunning solitude of pristine wilderness, surrounded by cliffs, canyons, mountains and hills. Porching is what it is all about, and the reason we showcase it as an adventure, to be enjoyed over and over and over again. 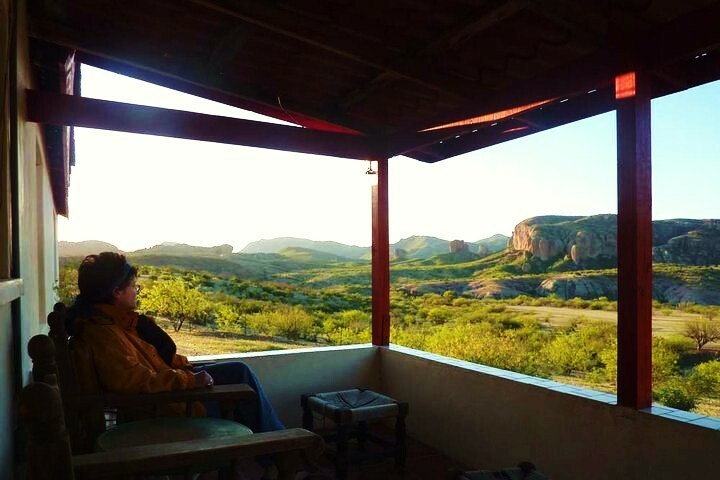 It is part of your stay at Rancho Los Baños, and we hope you take full advantage of this special, and unique, porch, in a setting that is incomparable, in a ranch that has no comparison.